and a New Cocktail Shaker Article in The Financial Times of London. Ah!!! The sound of ice cubes dancing in a cocktail shaker. Nothing is more welcome than that rhythmic sound which signals the hour before dinner when the appetite is wetted by the brew as liquors, fruit juices, syrups mix with various intoxicating alcoholic beverages are vigorously shaken into libations for the cocktail hour. My aunt Virgie’s husband Bruce, who prized among his possessions a cocktail shaker that looked like an airplane, was a master of the art and his airplane-inspired cocktail shaker went beyond the call of duty. Pictured here: the Duel-Fuel Cocktail Shaker with two side wings that double as flasks. A POPULAR ARTIFACT The 1920’s prohibition era in the United States. The quintessential era of cocktail shaker history, produced many different cocktail shaker shapes and designs including zeppelins, lighthouses, penguins and towering bullet shaped or skyscraper models. These were the icons of the Jazz Age when they reached their zenith of popularity. The leading expert on these sophisticated and stylish artifacts is Stephen Visakay, a collector and dealer of cocktail shakers and bar accoutrements, and whose fascinating collection numbers over 1,400. These winsome artifacts became celebrities in their own right and were associated with the glamorous lives of movie stars and took star billing in numerous movies. SOPHISTICATED CHICCocktail shakers became symbols of sophistication and the good life for the cognoscenti and everyone else wanted to get into the act, even some Art Deco devotees who attended a recent vernissage. Visakay introduced some of the cocktail shakers from his rare collection at a meeting /cocktail reception of (ADSNY) the Art Deco Society of New York. A lively gathering of Art Deco enthusiasts joined in the social amenities at an ADSNY member’s Deco- inspired apartment furnished with Art Deco artifacts and a spectacular cocktail shaker bar---truly we were in a stratospheric Art Deco venue with magnificent views. For information about ADSNY visit: www.artdeco.org. 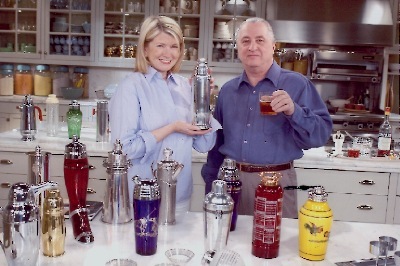 Visakay has been featured in numerous magazines and he has been named one of America’s top 100 collectors so anything you want to know about cocktail shakers can be had in his book Vintage Bar Ware –Identification and Value Guide or visit: www.visakay.com. With the advent of WWII the cocktail shaker had a brief demise because all non-essential uses of metal were redirected towards the war effort. 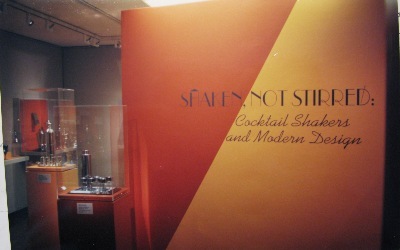 However, the cocktail shaker was never forgotten and it had a brief resurgence in the 1950’s in “rec rooms” with bars. Then the electric blender was the final blow. 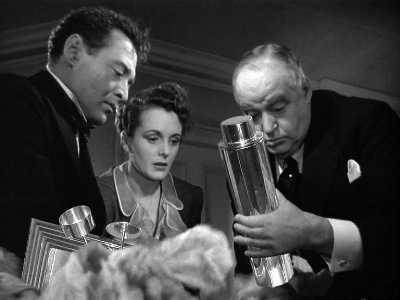 However, the innkeeper who invented the cocktail shaker as we know it can be rest assured that in bars and in private homes the cocktail shaker is holding its own today as a symbol of acquired taste and sophistication.